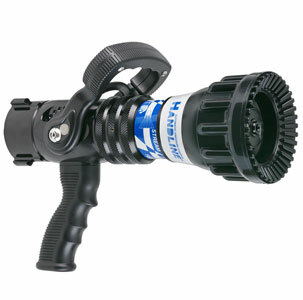 The full size Handline nozzle incorporates TFT’s unique stainless steel slide valve for turbulence free flow control and includes the exclusive integrated debris screen to prevent stream quality degradation. All models accept low and multi-expansion foam attachments for increased finished foam performance. 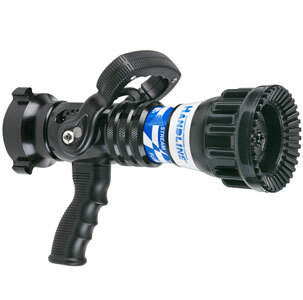 The full size Handline nozzle is available with 100, 75, or 55 psi operational pressure to meet any fire ground operational challenge. The high strength bonded rubber fog teeth provide a full filled pattern that pushes heat flame and smoke ahead and away from the firefighting team. The full size Handline nozzle comes standard with reflective labeling as well as your choice of color coded pistol grip and shut off handle. This constant pressure variable gallonage nozzle series is available in tip only, shut off, and playpipe configurations, is individually serialized, and comes with TFT’s exclusive 5 year warranty. 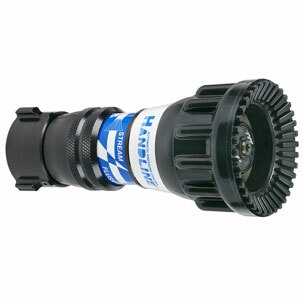 HANDLINE TIP 1.5" NH (38mm) Nozzle for use with separate valve or valved playpipe. Automatic 100 psi (7 bar) pressure control with a flow capacity of 95-300 gpm (360-1150 l/min). Includes flush without shutting down and molded rubber teeth for full-fill "power fog" pattern. Lightweight hardcoat anodized aluminum materials for maximum resistance to corrosion and wear. Tip does not shut off and must be used with a separate valve or valved playpipe. 1.5" NH (38mm) rigid rocker lug coupling is standard. 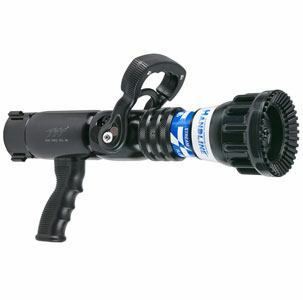 HANDLINE NOZZLE 1.5" NH (38mm) Automatic 100 psi (7 bar) pressure control with a flow capacity of 95-300 gpm (360-1150 l/min). Includes flush without shutting down, patented slide-type valve for turbulence-free flow control, six detent flow positions, molded rubber teeth for full-fill "power fog", and "Gasket Grabber" inlet screen. Lightweight hardcoat anodized aluminum materials for maximum resistance to corrosion and wear. 1.5" NH (38mm) rocker lug swivel coupling is standard. HANDLINE W/GRIP 1.5" NH (38mm) Automatic 100 psi (7 bar) pressure control with a flow capacity of 95-300 gpm (360-1150 l/min). Includes flush without shutting down, patented slide-type valve for turbulence-free flow control, six detent flow positions, molded rubber teeth for full-fill "power fog", and "Gasket Grabber" inlet screen. Pistol grip is mounted below the valve. Lightweight hardcoat anodized aluminum materials for maximum resistance to corrosion and wear.1.5" NH (38mm) rocker lug full-time swivel coupling is standard. 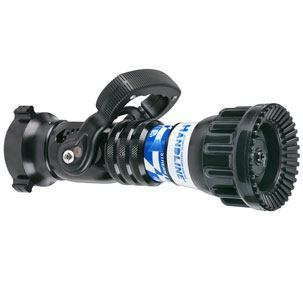 HANDLINE LONG GRIP 1.5" NH (38mm) Automatic 100 psi (7 bar) pressure control with a flow capacity of 95-300 gpm (360-1150 l/min). Includes flush without shutting down, patented slide-type valve for turbulence-free flow control, six detent flow positions, molded rubber teeth for full-fill "power fog", and "Gasket Grabber" inlet screen. Pistol grip is mounted behind the valve. Lightweight hardcoat anodized aluminum materials for maximum resistance to corrosion and wear. 1.5" NH (38mm) rocker lug full-time swivel is standard. 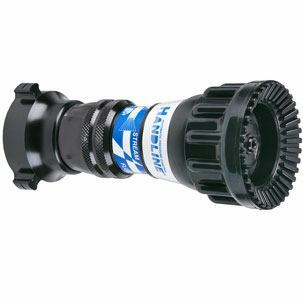 HANDLINE TIP 2.5" NH (65mm) Nozzle for use with separate valve or valved playpipe. Automatic 100 psi (7 bar) pressure control with a flow capacity of 95-300 gpm (360-1150 l/min). Includes flush without shutting down, molded rubber teeth for full-fill "power fog" pattern, and turbulence control. Lightweight hardcoat anodized aluminum materials for maximum resistance to corrosion and wear. Tip does not shut off and must be used with a separate valve or valved playpipe. 2.5" NH (65mm) rigid rocker lug coupling is standard. 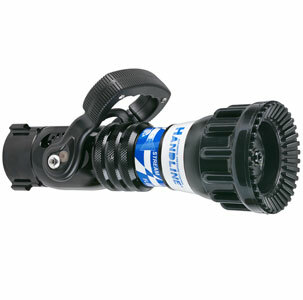 HANDLINE NOZZLE 2.5" NH (65mm) Automatic 100 psi (7 bar) pressure control with a flow capacity of 95-300 gpm (360-1150 l/min). For direct connection to 2.5" (65mm) hose line. Includes flush without shutting down, patented slide-type valve for turbulence-free flow control, six detent flow positions, molded rubber teeth for full-fill "power fog", and "Gasket Grabber" inlet screen. Lightweight hardcoat anodized aluminum materials for maximum resistance to corrosion and wear. 2.5" NH (65mm) rocker lug full-time swivel coupling is standard. 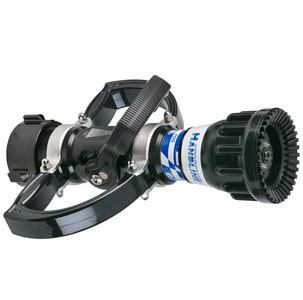 HANDLINE W/GRIP 2.5" NH (65mm) Automatic 100 psi (7 bar) pressure control with a flow capacity of 95-300 gpm (360-1150 l/min). Includes flush without shutting down, patented slide-type valve for turbulence-free flow control, six detent flow positions, molded rubber teeth for full-fill "power fog", and "Gasket Grabber" inlet screen. Pistol grip is mounted below the valve (H-2VPGI) or behind the valve (H-2VPG). Lightweight hardcoat anodized aluminum materials for maximum resistance to corrosion and wear. 2.5" NH (65mm) rocker lug full-time swivel coupling is standard. HANDLINE PLAYPIPE 2.5" NH (65mm) Smallest, most compact nozzle/playpipe combination available for use on 2.5" (65mm) or 3" (75mm) lines. Automatic 100 psi (7 bar) pressure control with a flow capacity of 95-300 gpm (360-1150 l/min). Includes flush without shutting down, patented slide-type valve for turbulence-free flow control, six detent flow positions, molded rubber teeth for full-fill "power fog" pattern, and "Gasket Grabber" inlet screen. Lightweight hardcoat anodized aluminum materials for maximum resistance to corrosion and wear. Nozzle is attached to valve and is not removable. Rubber coated handles are designed to reduce fatigue. 2.5" NH (65mm) rocker lug full-time swivel coupling is standard.